Have you read November edition yet? I hope so. This month is the highest viewed issue yet! The response has been truly amazing, it actually gets bigger and better every month. I want to say a huge THANK YOU to the following people who have helped MilliOnAir get seen and heard around the world… Elise C Quevedo, Laurie Stone, Steven Smith, Lori Mixson, Vanessa Brady OBE, ForwardPR, Vie Aesthetics, Lisa Harris Skin Science, Ross Pollard, Paul Sullivan, Felicities PR, Rise Media LA, Newcastle Film Festival, Anna Kennedy, Chris Divecchio and many more inspiring individuals that have contributed in and to MOA. ”You are inspirational” you know those people? The ones that you read about that help make you get up, be brave or do something you have never thought you could or would do? 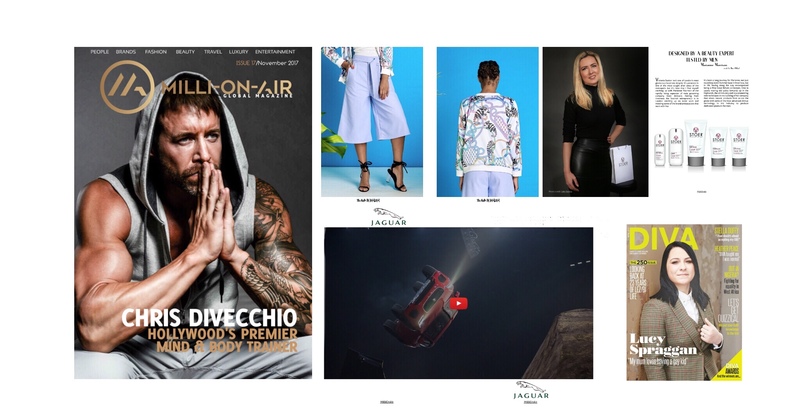 Those key people are the ones we want and need in MilliOnAir Global Magazine and we are so privileged to have included so many of these talents individuals…They are a very healthy boost to our everyday lives. November edit is no exception, with the likes of our cover story; the Hollywood mind and body trainer Chris Divecchio. The Prince’s School of Traditional Arts. Britains champion of diversity Linda Riley. Poker legend and multi-million pound charity fund raiser Phil Hellmuth and so many more inspiring individuals. Also included in November are beautiful fashion brands, stunning new video adverts from top luxury brands as well as showcasing the winners from the SBID International Design Awards.